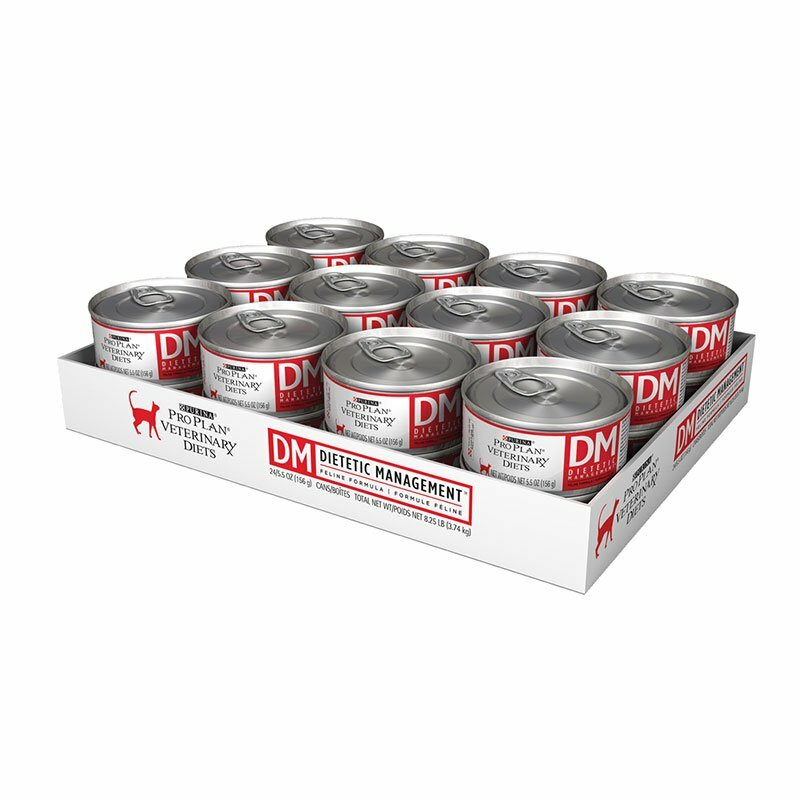 Purina Veterinary Diets DM Dietetic Management For Cats 24/5.5oz cans. Purina Veterinary Diets DM Dietetic Management feline formulas provide complete and balanced nutrition for the adult cat. Case of 24, 5.5-oz. cans. The vet recommended this for my 11 year old 20 lb diabetic cat and it seems he likes it. He is allowed two cans per day. He gets 3 units of Lantus injected twice per day. This has kept him healthy for the most part. His urinary tract has not gotten clogged up again either.. as he had that problem when he came to me at age 4, and had to have emergency surgery. My cat had a blood sugar of 698, now controlled with Purina DM only. When my 8 year old kitty had a UTB he was prescribed a certain food. But then at age 9 he became diabetic and they switched to this. Thankfully he likes it, which is all that counts, since I know some cats won't eat certain things. I can still give him supplements in the form of treats of chicken, chicken livers, and fish (raw or cooked) for variety, but this has helped keep his sugar levels in check along with his insulin shots. I love having the luxury of not having to get to the store or be in fear of running out. The delivery idea is valuable, especially when the weather keeps us inside! My cat's diabetes is under control with just feeding him DM cat food. When the disease was discovered his blood sugar was 697. Treated with insulin for just 2 weeks and then with DM Cat food and no insulin and the last test was a 97 blood sugar level. IT's been his exclusive diet for year.